In fall 2015, CSSD will convene two new working groups: Pacific Climate Circuits, which will apply lenses of race, class, gender and sexuality to current analyses of climate change in the Pacific Region, and The Legacy of Bandung Humanisms, which will examine the post-colonial developing world’s espousal of a radical brand of humanism and self-determination. Convening in 2015, Pacific Climate Circuits will apply lenses of race, class, gender, sexuality, and inequality to the current analyses of climate change in the Pacific Region. The working group, directed by Paige West, Department Chair and Professor of Anthropology, Barnard College; Kevin Fellezs, Assistant Professor of Music and African American Studies, Columbia University; and J.C. Salyer, Adjunct Lecturer, Sociology, Barnard College, examines the specific political-economic systems culpable for climate change in the region, linking them to its histories of colonialism and neoliberalism. Researchers will seek solutions outside the typical hard sciences approach, instead drawing on scholarship in the arts, the humanities, and the social sciences to scrutinize the region, its environment, and its peoples. The Legacy of Bandung Humanisms, also convening in the fall, is an interdisciplinary research project examining the workings of Bandung Humanisms, the progressive political, social, and cultural movement among nations of the Global South that refused to ally with either major power bloc during the Cold War. 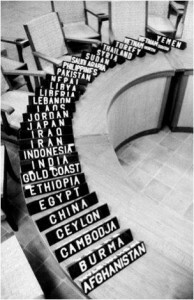 The working group, a collaboration between scholars at Columbia University and the University of California, Los Angeles uncovers the post-colonial developing world’s espousal of a radical brand of humanism and self-determination that gave rise to the Non-Aligned Movement of non-aggressor states. A diverse group of scholars including Stathis Gourgouris, Director, Institute of Comparative Literature & Society and Professor, Classics, Columbia University; Aamir Mufti, Professor, Comparative Literature, UCLA; and Lydia Liu, Wun Tsun Tam Professor in the Humanities, Department of East Asian Languages, Columbia University, will trace the institutions, associations, writings, and artworks identified with the Bandung Humanisms movement, connecting them to current global struggles for social justice.